Much like wisely deciding to repair the tattered roof of your home to protect against a surprise thunderstorm, the best time to contact an elder law attorney to adequately address the future needs of aging parents, a spouse or yourself is today. Long-term care arrangements are too often placed on the backburner of life’s priorities. The reasoning is as understandable as it is risky: While everyone is getting older, they continue being blessed with good health both physiologically and cognitively. Time, it is assumed, is on their side. However, poor health can occur in a flash at any age: A disabling stroke; the speedy onset of Alzheimer’s disease, Parkinson’s disease or dementia; a catastrophic auto accident. Suddenly, a family member loses the ability to manage their affairs. The incapacitating circumstance may necessitate that the afflicted person will need perpetual home care or to be placed in an assisted living facility. Waiting until such a time when snap decisions may be required and myriad questions are as yet unanswered could leave those in charge of the afflicted family member’s affairs feeling helpless and stressed. Contacting an elder law attorney well before that storm strikes eliminates those challenges and the accompanying uncertainty. It proactively ensures that an individual and their family will receive the highest degree of expertise, understanding and sound advice from those who are skilled advocates for the elderly, disabled and their families. 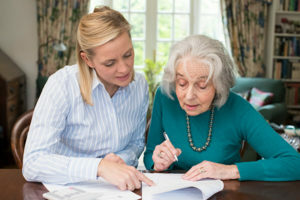 Attorneys who are experienced with elder care law offer expertise for seniors and their caregivers that can be of immeasurable assistance in moments of life transition. Raffaele Puppio’s lawyers have consistently been recognized among the best in Pennsylvania and are knowledgeable in elder law, advanced health care directives, end-of-life issues, elder neglect and exploitation, state and federal legislation affecting the elderly, living wills, probate law, special needs trusts, and advance directives, or durable power of attorney. Elder care lawyers, such as those at Raffaele Puppio, can assist in decision-making regarding all aspects of the well-being and rights of the elderly. Obtain information on health care and planning, including long-term care options, patients’ rights, Medicare/Medicaid, Social Security benefits, retirement, and power of attorney. Locate long-term care facilities, explain nursing home residents’ rights, and manage assisted living costs. Understand strategic gifting, guardianships and wills. Determine who will make decisions on your behalf if you become incapacitated. Develop a plan to preserve or transfer assets from a spouse needing to enter a long-term or life-care facility to ensure uninterrupted financial support of the spouse remaining at home. A major benefit that elder law attorneys can provide is to give guidance on how to avoid unnecessarily paying higher nursing care costs. For example, Medicaid will pay for an individual’s long-term care after an individual’s assets all have been used. Once a person’s funds are gone, Medicaid, a type of social welfare program to care for the sick in financial need, steps in. However, in Pennsylvania, as in many other states, Medicaid, which has a host of complex rules, has a five-year, or 60 months, “look-back” period. Simply stated, when one applies for Medicaid, any gifts or transfers of assets made within those five years of the date of application are subject to penalties based upon the value of the transfer or gift. For example, if a parent in Pennsylvania transferred their residence worth $200,000 to their son or daughter within five years of applying for Medicaid, the parent would incur a penalty and not be eligible to receive Medicaid benefits for approximately 662 days from the application date. But had an elder law attorney been contacted years earlier, Medicaid planning strategies could have been implemented and the parent could have transferred their residence to their child without incurring any penalty or delay in receiving long term care benefits. This is just one example of why it is vital to contact an elder law attorney years before the need occurs. The value to individuals in this case cannot be overstated. The attorneys at Raffaele Puppio are well-positioned to guide and assist those in need of elder law expertise. Contact us at 610.891.6710 to schedule an appointment.